These bite sized little gems are perfect for parties or holidays and no one will ever know they are this easy or that they are sugar free. The fillo shells are pre-baked – you can find them in the freezer section with the pies and cakes – making this a simple and delicious offering for a ‘mixed crowd’ barbecue or party. I have also used chocolate pudding mix and whipped cream for mini chocolate cream pies! 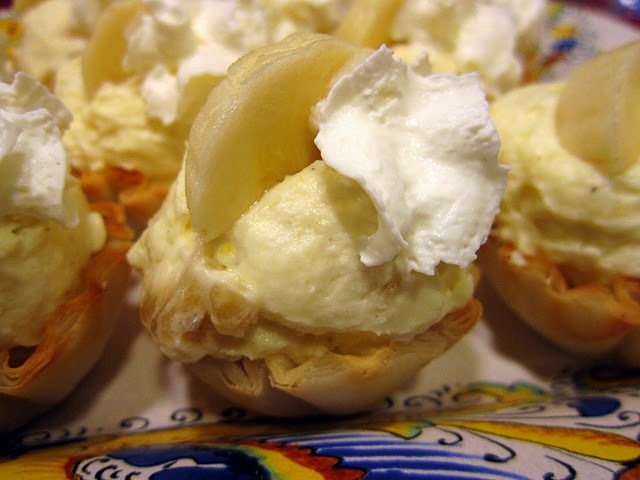 These mini banana cream pies are a huge crowd pleaser – make enough for at least three per person. I am a food perfectionist when it comes to serving and have several inexpensive metal ice cream scoops from the supermarket in different sizes; the one teaspoon size allows you to plop a perfectly formed scoop of pastry cream right into the tiny crisp cup! When making these for a party I have filling prepared in Gladware and ready to be assembled last minute so the filo shells stay crisp! Pour the pudding mix into a small deep mixing bowl. Stir in the half & half and vanilla; blend for three minutes using an electric hand mixer. Chill until set, 15 to 20 minutes. Arrange fillo shells on a decorative platter and set aside. Place a teaspoon of the pastry cream into each of the fillo shells and top with one thin slice of banana and squirt of whipped cream. Serve immediately.